What can I send to Thailand? What items are restricted? Please ensure you have read the Thailand destinations page to fully understand the customs clearance process as this will vary depending on your personal circumstances and not all personal effects shipments are eligible for duty free clearance. If you are planning to experience the outdoors or take in a few rounds of golf you may want to take your own equipment with you. This can be an expensive choice given that the airlines charge extortionate fees for excess baggage, but Send My Bag can help with our cheap shipping to Thailand. Our carrier service can pick up your heavy and bulky luggage from your home and deliver it anywhere in Thailand quickly and securely, and at a reasonable price. This is especially helpful if you have multiple transfers during your journey. It takes the worry and hassle out of transporting your own luggage, hiring additional vehicles to carry your items or carting heavy bags through multiple airports and checkpoints. Our service is great for backpackers and tourists alike, but is also handy for students relocating to or from the country to expand their skills. When travelling or moving to Thailand, you should research the range of options available for shipping to Thailand, as not all options will be practical for you in your particular circumstances. You can choose between a number of different options for international shipping to Thailand. Here are some of the options below. You can send your luggage and boxes to Thailand with Send My Bag. Whether you are going on holiday or relocating to Thailand, sending your bags can save you a lot of hassle when it comes to negotiating public transport. It also means that you can have with you many more of your personal belongings than if you brought them with you on board a plane. Send My Bag has many international routes, with a great-value flat rate for each route up to a massive 30 kg. This means that you can bring your favourite clothes, books, DVDs, etc. to quickly help you set up home abroad. To find out more about sending baggage to Thailand, visit our 'How it works' page, or check out our Knowledge Base. You can send golf clubs to Thailand with Send My Bag. This means you can avoid any oversized or overweight baggage fees that airlines might charge. By shipping your golf bag to Thailand, you can enjoy all the fantastic golf courses that Thailand has to offer, such as Black Mountain Golf Club, The Legacy Golf Club and Ayodhya Links. You won't have to borrow golf clubs but can use your own instead, allowing you to properly enjoy each round of golf. Before you send your golf clubs to Thailand, make your find out how best to package your items by visiting our information page on sending golf clubs. If you are moving to Thailand, whether for business or for pleasure, there will be many possessions that you need to take with you. Although you may have a clear out and manage to bin or donate a few items, there will still be many items that you simply cannot part with, and many that will be essential for your wellbeing when relocating abroad. You will, therefore, need to consider international removals to Thailand. Before you hand your items over to the movers, you should make sure that everything is well packaged and that you are not handing over anything that is too fragile and that could get damaged in transit. Use appropriate containers for your items and seal all packages well. Also, make sure you don’t accidentally pack anything for international removal that you will need in the short term or during your journey. Thailand has a number of good universities, including Chulalongkorn University, Mahidol University and Chiang Mai University. If you are travelling to Thailand to study you can send your possessions with Send My Bag to help you sent up home in your student accommodation. Check out our student removals page to learn more and to find out how to get 10% student discount. Once you have arrived in Thailand, you may find that you have left something behind at home. In this case, you could ask a family member to send a package to Thailand for you. You can also stay in contact with people at home by sending and receiving Christmas or birthday presents. If your loved one has moved abroad to Thailand, you may wish to send them a care package to help them settle in and to remind them of home. This is a great idea for students spending a year abroad in Thailand or for expats who have gone to live in Thailand. Send My Bag can send parcels internationally to Thailand for you. Just make sure your parcel is packaged properly so that everything arrives safe and sound. Have a look at our 'FAQs' to find out what you can send with Send My Bag and how to package your items. It is possible to use air freight to transport items to Thailand. Air freight might travel on passenger planes or on specific air cargo planes. You may choose this option if you have large items to transport, such as a dining table or armchair. You will be charged for this service based on the weight and size of your shipment. Sending items by air freight generally takes one to two days and is faster than sea freight shipping, but usually more expensive. So, if time is of the essence, this option may be for you. You will, however, need to use the services of a customs agent to clear your items through customs for you. You will also need to arrange transport for your items to and from the airport. Therefore, you need to take into account several costs when assessing the viability of this option for you. If you send internationally by air freight to Thailand your items would likely arrive at one of the major airports, such as Bangkok, Chiang-Mai, Hat Mai or Phuket. Shipping your possessions to Thailand by sea rather than air freight is an option for sending large items that you don’t need access to immediately. Choosing sea freight can work out cheaper than paying for air freight. Sea freight usually means shipping items in containers. With container shipping your items are transported within a large container (usually the size of a truck) on board a cargo ship. You might choose this option if you have sizeable items to transport internationally, such as a sofa or a bed – items that will help you set up home quickly in Thailand. As with air freight, you will need to use the services of a customs agent to clear your items through customs. You will also need to sort out transport for your items to and from the relevant ports. It is, therefore, easy to see how costs can rapidly mount up when choosing sea freight. When using container shipping to Thailand your items will likely arrive by ship at one of Thailand’s big ports, such as KlongToey or Laem Chabang – the main port for container ships. Container shipping internationally to Thailand from somewhere like the UK would normally take around 16 to 21 days. If shipping by container you will need to choose which size of container best fits your needs. For a 40ft container travelling to Thailand from the UK you would normally expect to pay in the region of £4000. When shipping goods to Thailand you need to do your research to make sure that you abide by the country’s customs rules. 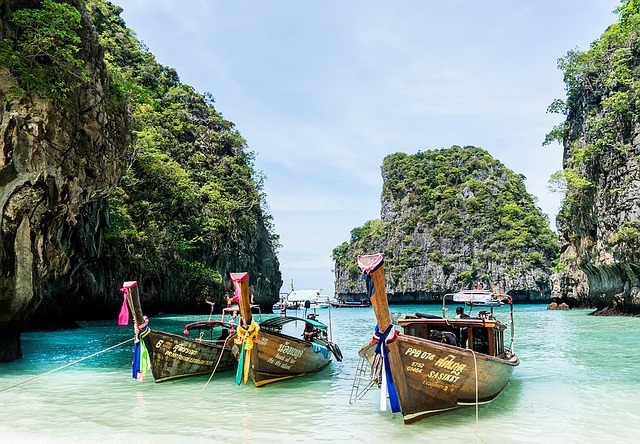 You will need to be aware of any duty that you need to pay and what items are allowed to be shipped to Thailand, which items have restrictions attached, and which are entirely prohibited. You should have a look at the section below on ‘What can I send to Thailand? What items are restricted?’ As you will see below, items that you are not allowed to ship to Thailand include: tobacco, religious artefacts, perishable food items and loose batteries. The bag was picked up on time, delivered on time, the processes were easy to understand and the website is clear and helpful. Not cheap, as I said above, but good value. Thai Customs will only permit either Thai Nationals who are returning to Thailand after more than 12 months abroad, or non-nationals who have been issued with a 12 month non-resident work visa or non-resident ID Card to receive some exemptions from paying duty and taxes. Duty exemption is not currently available to individuals visiting the country temporarily such as on holiday or a short business trip, therefore we would advise contacting the relevant customs authorities in Thailand before shipping so that you are aware of the amount of duty and taxes which may be applicable. In order to clear shipments, Non-Thai nationals may be required to physically supply their passport showing their entry stamp in Thailand and non-resident work visa or ID Card if held, to the local couriers office when shipping Personal Effects (if unable to travel to our partners office, they can arrange for a courier to collect the passport from you). Thai nationals sending to Thailand will need to provide proof that they have been outside of the country for 12 months. Personal and Household effects must be imported no earlier than one month prior to the importer’s arrival and not later than six months after their arrival. In addition to any duty and taxes applied, additional charges of around 1500THB may be applied for customs processing, and storage charges may be applied should documentation requested for clearance not be provided immediately. Major cities popular with tourists include Bangkok, Thailand’s bustling capital, the historic city of Ayutthaya and the gateway to the Golden Triangle at Chiang Rai. Each city offers something different for the traveler, from mountain trekking to lively nightlife and a chance to experience the diverse culture and history of this magnificent country. Thailand’s climate is tropical and is hot and humid throughout most of the year, averaging between 28 and 35°C, making it a great destination for sun seekers. The official language of Thailand is Thai and, although English is a mandatory school subject, the number of fluent speakers is very low especially outside of the cities and main tourist areas. The food alone is a perfect reason to visit Thailand and the wide range of curries, stir fries and fresh fish dishes is truly staggering. Food is relatively cheap and buying food from stalls and sidewalk restaurants is quite safe unlike other Asian countries. Strong flavours dominate much of Thailand’s cuisine, especially spices and fresh herbs. Rice and noodles are staples of Thai food so expect at least one of these with your dishes. With a wide range of activities to experience in Thailand it is easy to see why it is so popular with tourists. Historical and cultural attractions are high up on many people’s lists, but for those who want to relax, the beaches are among some of the best in the world hence why we see more and more removals to Thailand. For outdoor lovers, Thailand offers almost any outdoor sport including scuba diving, rock climbing, mountain treks and boat tours, all at very reasonable prices. Golf is also becoming a popular pastime among tourists with many of the newer golf courses designed by top names such as Jack Nicklaus and Nick Faldo. Popular with adventurous backpackers and sun seekers alike alongside the increase in people moving to Thailand, it offers something for everyone.